A private member's bill to protect the Quebec City Arena from lawsuits has triggered another resignation from the Parti Quebecois, and an admission from opposition leader Pauline Marois that she may have made a mistake. In a scrum following a lengthy caucus meeting that was punctuated by Jean-Martin Aussant's announcement he was leaving the party, Marois said that Bill 204 was never discussed within the PQ ranks before it was tabled in the National Assembly. "This is the first time we've not had a debate before proposing a bill," said Marois. "For me, in all sincerity, when this famous bill was proposed, there were 25 other bills as precedent where we had consensus." PQ MNA Agnes Maltais proposed the immunity lawsuit in mid-May, and it was locked into special hearings which wrapped up last week. Marois, who supports the Arena and her member's proposal to protect the project from legal interference, was facing opposition from within her own ranks. On Monday three MNAs left the PQ saying they could not stomach being forced to vote for a bill that prevent citizens from questioning the legality between Quebecor, the provincial government and the city of Quebec. Tuesday morning Jean-Martin Aussant, the MNA for Nicolet-Yamaska, announced his resignation, saying that like three other former PQ members he would sit as an independent. Aussant, who was known as a hardline sovereigntist, said he was disappointed with the PQ leadership's decision to downplay sovereignty in hopes of gaining electoral support. "In my opinion there is no bad timing to talk about sovereignty, there are only bad messengers," said Aussant. Holding back tears, Aussant apologized for leaving the party. "To those who are sad or angry, I have to apologize," Aussant said. "It is in good faith that I take my leave." Aussant's resignation comes one day after abrupt resignations by Louise Beaudoin, Pierre Curzi and Lisette Lapointe. Tuesday morning the party held an emergency caucus session inside the National Assembly. On her way into the meeting party leader Pauline Marois said only that "My morale is very good" but the mood of MNAs leaving the meeting was anything but happy. CTV's Quebec bureau chief Kai Nagata says that several MNAs were teary-eyed as they left the meeting immediately after news broke of Aussant's resignation. That meeting continued at noon. The four MNAs who left the PQ say they have many reasons for leaving: Marois's autocratic leadership style; Bill 204 to protect the Quebec City arena; the party's refusal to push hard for sovereignty; the tone of political debate. When asked Aussant said that even though Marois was recently re-confirmed as leader of the PQ by 93 percent of delegates, he said she is not good at convincing the public. "Should Marois quit? I don't mince words. Yes," said Aussant. Despite his harsh criticism, Aussant said Marois would make a fine premier, but that she is never going to lead Quebec to independence. "I'm here to work on sovereignty and I don't think she's the one Quebecers will want to follow at a very high rate towards sovereignty. That's a very cruel statement. It's a hard one to say, it's probably a hard one to hear. Aussant was one of four hardliners running the "ABCD for Sovereignty" video and touring series, where he along with Yves-Francois Blanchet, Alexandre Cloutier and Bernard Drainville explained the benefits of an independent Quebec. Beaudoin, Curzi, Lapointe and others were also disappointed with Marois's decision to stop actively and constantly campaigning for sovereignty. However Curzi reiterated on Tuesday that his main reason for leaving the PQ was his disagreement over Bill 204, the private member's bill sponsored by MNA Agnès Maltais that would prevent anyone from mounting a legal challenge to the arena management contract between the Quebec City municipal government and Quebecor Media. "I think the problem is that right now the people, the citizens are asking the elected people, they are asking them to have principles and to hold to their principles," said Curzi. "I think this law project was going against the will [of the people]." "It is saying you must restrict your freedom of speech, you must vote like your party has decided you are going to vote, even if it goes against your own ethical principles. Marois says that her caucus, despite the resignation of four members, fully supports the proposal to protect the Quebec Arena from lawsuits. "My caucus is for the amphitheatre," said Marois. "I think that from this point forward we have to close ranks." However Claude Cousineau, the representative for Bertrand, said before Tuesday's meeting that he would like to see a free vote take place on Bill 204. or he would quit. Bill 204 still faces stiff opposition from Quebec Solidaire representative Amir Khadir and independent MNA Eric Caire, it is very unlikely to be passed before the end of the current legislative session. There was the possibility that Municipal Affairs minister Laurent Lessard would include language duplicating Bill 204 in an omnibus bill to be passed by the end of the session. However there are reportedly many members of the Liberal caucus who also oppose the idea of immunizing the arena from legal action, so that idea is increasingly unlikely. Many pundits have speculated that the four departing MNAs could join former PQ MNA Francois Legault and his Coalition for the Future. As for Curzi, on Tuesday he said that he is content to act as an independent, but would not rule it out. "There was no script written before [I resigned]," said Curzi. I don't know for sure what it is going to be." For his part Aussant roundly rejected that notion, saying that he and Legault were on opposite sides of the sovereignty spectrum. 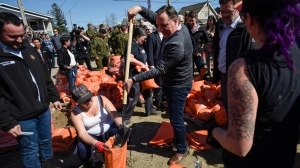 "For those who think that I will join the movement of Francois Legault, it is the last thing I will do," said Aussant. "I think the Legault movement is populism of the worst kind."